Perhaps this will be your dinner tonight? This is yet another one pot-ish wonder. I love recipes like this because they're pretty easy and extremely satisfying. This recipe also happen to be healthy and packs in some flavors you, and guests, are most likely to love. The sweetness and kick is subtle, but not forgotten. It's a great dish that will get you out of a slump of perhaps going back to the same recipes again and again. Heat oil in a medium Dutch oven over medium heat. Add onion and celery, and cook until soft and translucent, 10 minutes. Add garlic, and cook until soft, 2 minutes. Add chicken, orange juice, vinegar, currants if you have them (I couldn't find them! ), sugar, and peperoncini. 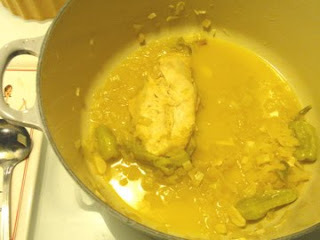 Bring to a simmer; cover, and cook until chicken is cooked through, 20 minutes. Meanwhile, bring a pot of water to a boil. Add couscous, and cook until al dente. Drain. Serve chicken with sauce over couscous. The recipe calls for skinless bone in chicken. Good luck finding that. 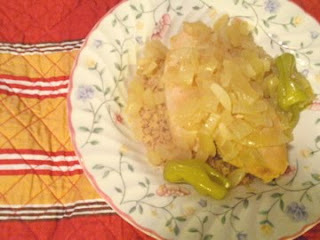 I got a package of skinless breasts and was able to have 4 servings from this dish. I couldn't find currants at my stores, but raisins would work as well. Also, you could use Israeli couscous or orzo to make it a bit prettier and more presentable for guests if you'd like. For me and my friend, this dish was just fine.